MultiCam is continually striving to offer the latest technological advances in CNC cutting technology. But we recognize that sometimes there is resistance to change, especially when the advances are not well understand or are as yet not widely adopted. We are often asked why we offer HSK style toolholders on the majority of our systems, rather than the standard toolholders such as CAT, SK and BT. An article written by Dr. Eugene Kocherovsky gives a highly detailed explanation on the benefits of using HSK toolholders rather than the older style. Despite its growing use and acceptance in the United States, HSK technology remains widely misunderstood. Questions about its proper use have created substantial resistance among those who are accustomed to traditional, steep-taper shanks, including CAT, SK and BT. Although a significant portion of the machine tools imported to the United States from Europe incorporate HSK spindles, steep-taper shanks still represent the most widely used tooling interface. 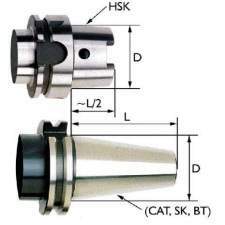 The acronym “HSK” is the German abbreviation for “hollow taper shank.” An HSK shank has a ratio of 1:10, compared to CAT (BT, SK) shanks that have ratios of 7:24. HSK shanks must be connected to machines via compatible HSK spindle receivers. Whereas steep-taper shanks were developed prior to standardization, HSK shanks were developed to address performance problems associated with the traditional interfaces, particularly in high speed machining applications. The first category of comparison is radial and axial stiffness- the most important aspects of any machining operation. Unlike conventional shanks, an HSK shank is hollow and the clamping mechanism operates from the inside (Figure 3, at right). The end of a typical, HSK Type A shank incorporates two drive slots that engage milled drive keys in the spindle receiver. The wall of the hollow shank deflects slightly when it’s clamped into the receiver. Radial access holes in the shank’s wall allow the clamping mechanism to contact an actuation screw. The inner surface of the shank wall also incorporates a chamfer to facilitate clamping. Although different clamping methods are available depending on the tooling manufacturer, all HSK receivers incorporate segmented collets that expand radially under drawbar pressure to bear against the inner wall of the shank. Because the collet’s chamfer matches the chamfer of the shank’s inner wall, the shank is locked securely into the receiver when the drawbar is actuated. When this occurs, elastic deformation of the shank’s walls creates firm metal-to-metal contact around the shank, as well as mating the shank’s flange with the receiver. Assuming that equivalent force is applied to the drawbar, twice as much clamping force is exerted on the flange of an HSK shank compared to a steep-taper shank. This extra clamping force makes the radial stiffness of HSK toolholders up to five times greater than the value for CAT, SK or BT. This makes the tool more resistant to bending loads, thus allowing deeper cuts and higher feedrates in milling and boring operations. Higher rigidity also translates to a higher natural frequency for the cutting system. This allows a tool to be operated at higher speeds before resonance or “chatter” commences. Because tool deflection is reduced, machining accuracy and surface finish also improve. The HSK interface also offers some key advantages in relation to high speed machine spindles, tool collisions and maintenance. Using a conventional interface (CAT, SK, BT) at spindle speeds greater than 8,000 rpm, the spindle receiver expands at a much higher rate than the toolholder shank. This causes the shank to be pulled back axially into the spindle under the force of the drawbar. This changes the Z-axis position of the tool tip and often locks up the toolholder inside the receiver, thus making tool-changing difficult. Conversely, the design of the HSK connection prevents the shank from pulling back into the receiver during high speed operation. Because of the short length of the HSK taper (approximately one-half the length of a CAT shank) and the lighter weight of its hollow shank, tool changes can be completed more rapidly than is true with conventional toolholders. Part of this time savings results from the fact that the HSK interface does not require a retention knob to clamp the shank. When a tool collision occurs using a conventional, steep-taper shank, the potential damage can be considerably greater than is true when using an HSK shank. Because a CAT (SK, BT) shank is solid steel, most of the collision load (and damage) transfers to the spindle. With its hollow design, however, the HSK shank acts as a fuse during collisions. When a cutting tool crashes, the toolholder breaks off and protects the spindle, thus reducing repair costs and machine downtime. Variable cutting conditions can adversely affect the CAT (SK,BT) interface. This applies particularly to modern CNC machining centers that are used in flexible manufacturing systems. Under these circumstances, machines may operate at low speed and high torque, as well as high speed and low torque. Because conventional toolholders are clamped from the outside, centrifugal force causes the spindle walls to expand faster in relation to the shank at spindle speeds higher than 8,000 rpm. Consequently, the draw bar force pulls the shank deeper into its receiver, changing the position of the tool tip and frequently locking up the tool. The HSK interface is not subject to this problem because of firm contact between mating components. This contact is enhanced at high speeds because, as the collet segments in the receiver rotate inside the hollow shank, centrifugal force increases the clamping force.